Oxygen tube assembly, Mk7A. Standard corrugated rubber tube for all aircraft fitted with ejection seats and emergency oxygen equipment. 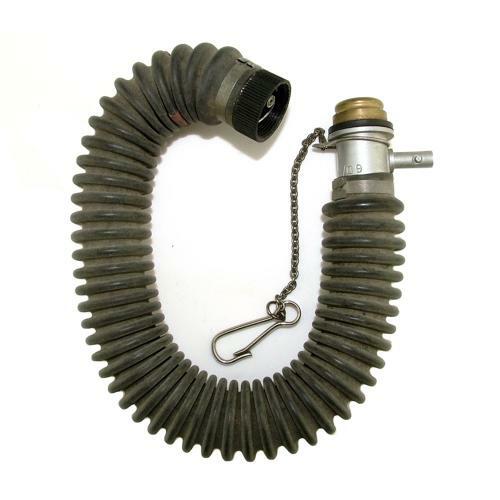 It has fittings for attaching to the oxygen mask and a quick release connector with portable oxygen supply pipe. Circlip bound. Shows use and wear but is in very good undamaged condition. No cracking, even within the folds of the tube. The overall shape is 'curved' at one end and the internal microbore tube clip is detached at the upper end of the mask (see photographs). Stock code O23450.